, Lord Dorchester, an eminent statesman in the beginning of the seventeenth century, the eldest surviving son of Anthony Carleton, esq. of Baldwin Briglitweli, near Watlington,Oxon. was born at his father’s seat, March 10, 1573. He was educated at Westminster school, and at Oxford, where he became a student of Christ church about 1591, and distinguished as a young man of parts. From hence, after taking a bachelor’s degree in 15L<5, he set out on his travels, and on his return to Oxford, was created master of arts in July loOO. In the same year we find him appointed secretary to sir Thomas Parry, our ambassador in France and in 1603 he served in the same capacity in the house of Henry earl of Northumberland. 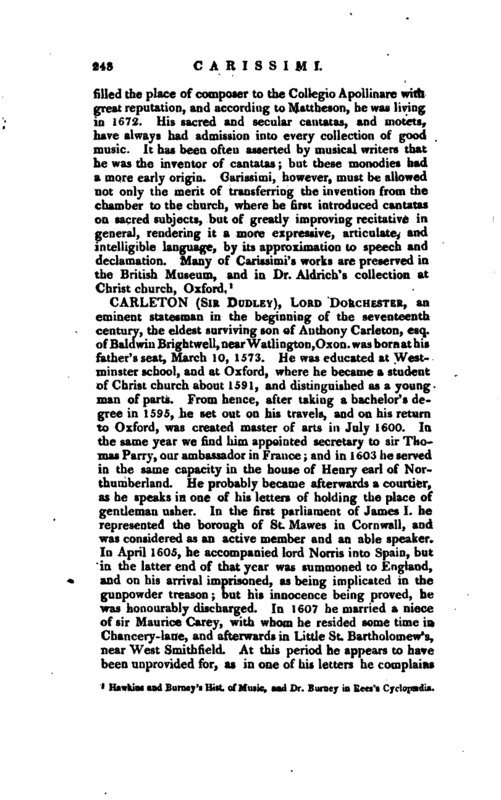 He probably became afterwards a courtier, as he speaks in one of his letters of holding the place of gentleman usher. In the first parliament of James I. he represented the borough of St. Mawes in Cornwall, and was considered as an active member and an able speaker* In April 1605, he accompanied lord Norris intoSpain, but in the latter end of that year was summoned to England, and on his arrival imprisoned, as being implicated in the gunpowder treason but his innocence being proved, he was honourably discharged. In 1607 he married a niece of sir Maurice Carey, with whom he resided some time in Chancery- lane, and afterwards in Little St. Bartholomew’s, near West Smitlitield. 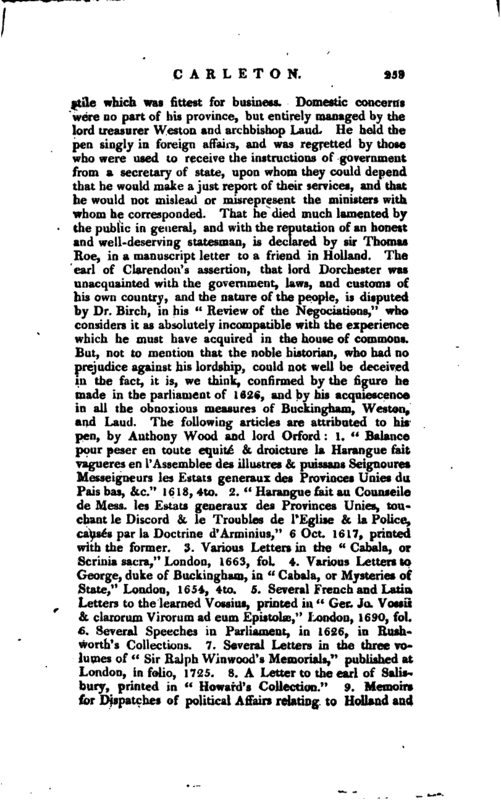 At this period he appears to have been unprovided for, as in one of his letters he complains | of an “army of difficulties, a dear year, a plaguy town, a growing w if e and a poor purse.” After being disappointed, from political reasons, in two prospects, that of going to Ireland, and that of going to Brussels, in an official capacity, he was nominated to the embassy at Venice, and before setting out, in Sept. 1610, received the honour of knighthood. The functions of this appointment he discharged with great ability, and soon proved that he was qualified for diplomatic affairs. In 1615, he returned to England, sir Henry Wotton being appointed in his room, and on his arrival found all ministerial power and favour centered in sir George Villiers, afterwards duke of Buckingham. Soon after, on the recommendation of sir Ralph Win wood, one of the secretaries of state, he was employed in what was then one of the most important embassiesin the gift of the crown, that to the States General of Holland and in this he continued from 1616 to 1628, and was the last English minister who had the honour of sitting in the council of state for the United Provinces, a privilege which queen Elizabeth had wisely obtained, when she undertook the protection of these provinces, and which was annexed to the possession of the cautionary towns. On his arrival in Holland, he was soon involved in the disputes which then raged between the Arminians and Galvinists; and as the French supported the pensionary Banievelt, sir Dudley took the part of prince Maurice. His situation here, owing to the politics of the duke of Buckingham and other events, which belong to the history of the times, was one of peculiar delicacy and difficulty; yet he appears to have conducted himself as ambassador from England, with great wisdom, firmness, and prudence. 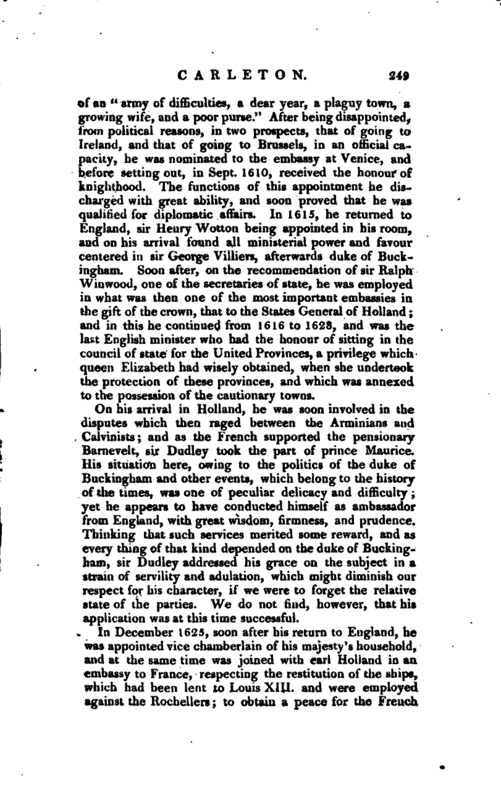 Thinking that such services merited some reward, and as every thing of that kind depended on the duke of Buckingham, sir Dudley addressed his grace on the subject in a strain of servility and adulation, which might diminish our respect for his character, if we were to forget the relative state of the parties. We do not find, however, that his application was at this time successful. In December 1625, soon after his return to England, he was appointed vice chamberlain of his majesty’s household, and at the same time was joined with earl Holland in an embassy to France, respecting the restitution of the ships, which had been lent to Louis XIII. and were employed against the Rochellers; to obtain a peace for the French | protestants agreeably to former edicts, and to obtain the French accession to the treaty of the Hague. Although all these objects were not attained in the fullest intention, yet the ambassadors were thought entitled to commendation for their firm and prudent management of the various conferences. On their return in March 1625-6, they found the parliament sitting, and the nation inflamed to the highest degree at the mismanagement of public affairs. At this crisis, sir Dudley Carleton, who represented Hastings in Sussex, endeavoured to mitigate the violence of the commons in their impeachment of the duke of Buckingham; but his arguments, although not well suited to the humour of the time, were acceptable at court, and immediately after he was called up to the house of peers by the style and title of Baron Carleton of Imbercourt in the county of Surrey: and his next employment was more fully adapted to his talents. This was an embassy-extraordinary to France to justify the sending away of the queen of England’s French servants, which he managed with his usual skill. 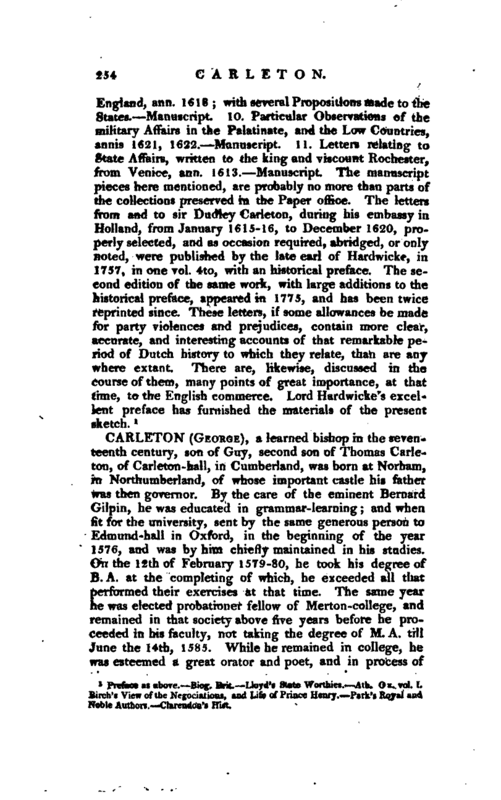 In March 1626-7, he was ordered to resume his character of ambassador in Holland, where our interest, from various causes, was on the decline, and required all his address and knowledge to revive it. He had many conversations with the states on the existing differences, his conduct in all which received the approbation of his’royal master, but he had not the same influence with the States as on former occasions; and returned in May or June 1628, leaving as his deputy, Mr. Dudley Carleton, his nephew, who had discharged that trust before during his absence, with diligence and capacity. Soon after his arrival in England, king Charles bestowed an additional mark of his approbation, by creating him viscount Dorchester; and in the mean time he continued to attend the court in his office of vice chamberlain, and was employed in foreign affairs of the most secret nature, as assistant to the duke of Buckingham. When that minister set out for Portsmouth to take the command of the fleet and army, which was preparing for the relief of Rochelle, lord Dorchester accompanied him, and was entrusted by Contarini, the Venetian Ambassador here, to manage the first overtures of an accommodation with France, which was interrupted by the murder of the duke of Buckingham. King Charles, then declared he would, for the future, be his own first | minister, and leave the executive part of the administration to every man within the compass of his province. The first question.of importance which came before the council was, whether the parliament should sit on the day appointed, the 20th of October. Some were of opinion, that it would be the most probable method of restoring a happy union between the king and his people; but his majesty declared his pleasure for a further prorogation till the 20th of January, 1628-9, which lord Dorchester says he thought the wisest course. 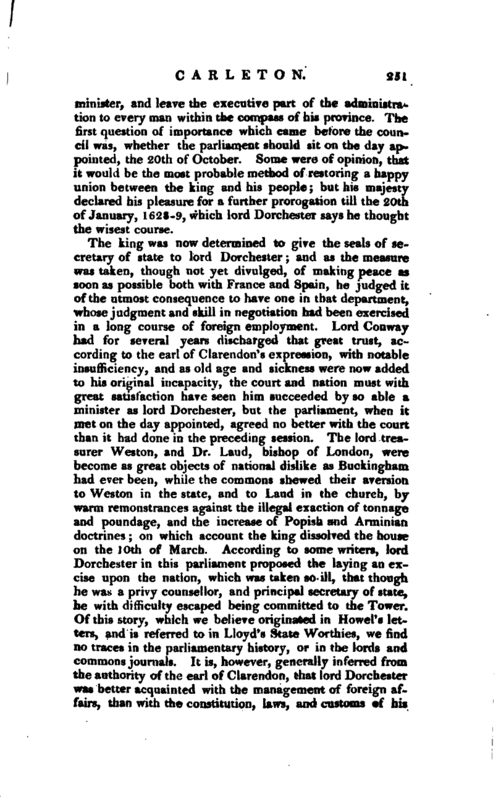 The king was now determined to give the seals of secretary of state to lord Dorchester; and as the measure^ was taken, though not yet divulged, of making peace as soon as possible both with France and Spain, he judo-ed it of the utmost consequence to have one in that department, whose judgment and skill in negotiation had been exercised in a long course of foreign employment. Lord Conway had for several years discharged that great trust, according to the earl of Clarendon’s expression, with notable insufficiency, and as old age and sickness were now added to his original incapacity, the court and nation must with great satisfaction have seen him succeeded by so able a minister as lord Dorchester, but the parliament, when it Inet on the day appointed, agreed no better with the court than it had done in the preceding session. The lord treasurer Weston, and Dr. Laud, bishop of London, were become as great objects of national dislike as Buckingham had ever been, while the commons shewed their aversion to Weston in the state, and to Laud in the church, by warm remonstrances against the illegal exaction of tonnage and poundage, and the increase of Popisb and Arminian doctrines; on which account the king dissolved the house on the lOth of March. According to some writers, lord Dorchester hi this parliament proposed the laying an excise upon the nation, which was taken so ill, that though he was a privy counsellor, and principal secretary of state, he with difficulty escaped being committed to the Tower. Of this story, which we believe originated in Howel’s letters, and is referred to in Lloyd’s StateWorthies, we find no traces in the parliamentary history, or in thejords and commons journals. 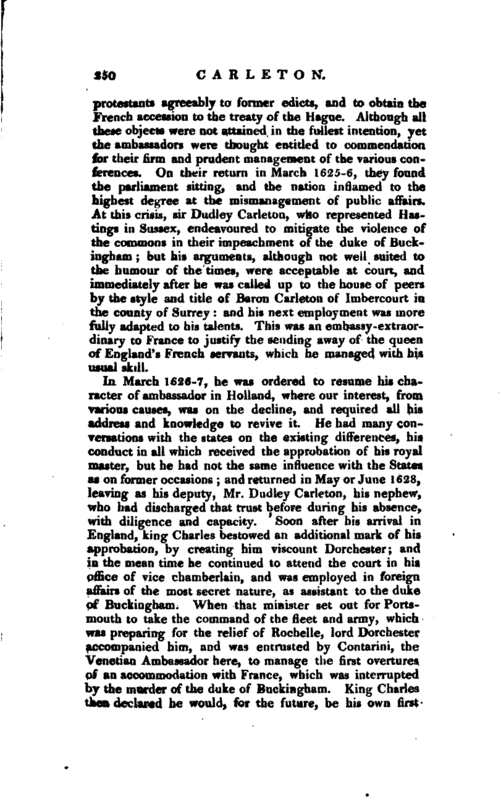 It is, however, generally inferred from the authority of the earl of Clarendon, that lord Dorchester was better acquainted with the management of foreign affairs, than with the constitution, laws and customs of his | own country. In his capacity of secretary of state, he was a chief agent in carrying on and completing the treaties with France and Spain; and besides these, he directed in the course of the years 1629 and 1630, the negociations of sir Henry Vane in Holland, and sir Thomas Roe in Poland and the maritime parts of Germany. The former was sent to the Hague, to explain to the States the motives of our treaty with Spain, and to sound their dispositions about joining- in it; and the latter was employed as mediator between the kings of Sweden and Poland after which he was very instrumental in persuading the heroic Gustavus Adolphus to undertake his German expedition. 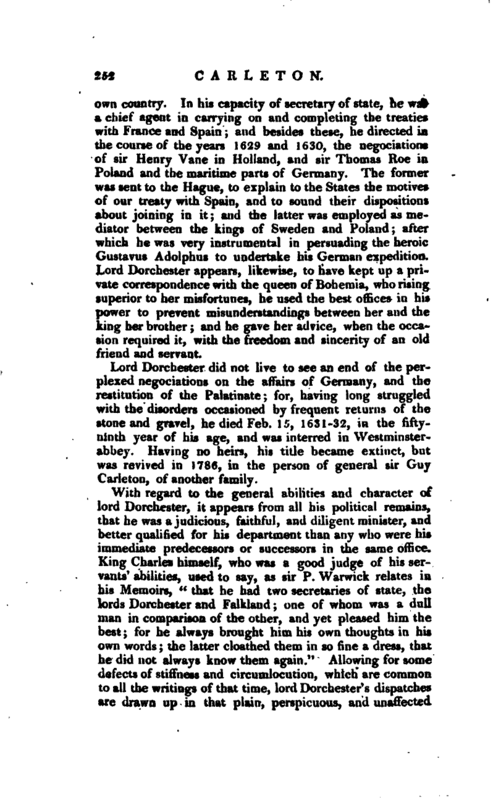 Lord Dorchester appears, likewise, to have kept up a private correspondence with the queen of Bohemia, who rising superior to her misfortunes, he used the best offices in his power to prevent misunderstandings between her and the king her brother; and he gave her advice, when the occasion required it, with the freedom and sincerity of an old friend and servant. Lord Dorchester did not live to see an end of the perplexed negociations on the affairs of Germany, and the restitution of the Palatinate; for, having long struggled with the disorders occasioned by frequent returns of the stone and gravel, he died Feb. 15, 1631-32, in the fifty ­ninth year of his age, and was interred in Westminsterabbey. Having no heirs, his title became extinct, but was revived in 1786, in the person of general sir Guy Carleton, of another family.